There was snow on the mountains but the sun was wonderfully warm in the town. I was staying with Genti and his family and on the first day it was so hot Genti and I walked round Gjakova in just a tee-shirt – not the same t-shirt obviously, looking at possible locations for filming in the summer. to film the children singing “we’ve got the whole world in our hand” and making paperchain people for Comic Relief. Older certainly, but wiser? I don't know. The speed that technology moves is quite alarming and can leave the unaware completely clueless. I grasp what clues I can as they fly past. Yesterday, with the help of Mr Jones, we gathered technology about us and reached the point where the computer was controlling the camera. Time was we exposed celluloid film, covered with a fine emulsion, that had to be developed by the addition of a series of chemicals in complete darkness. This was then treated to further excitement with an enlarger and focused light cast upon paper similarly treated with light sensitive emulsions which in turn had to be immersed in various chemical baths. 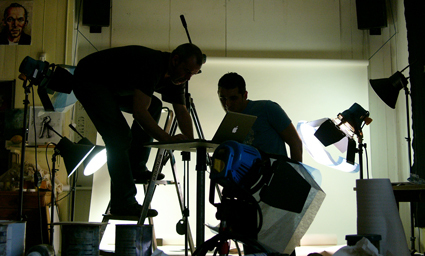 The whole process could take, at top speed, up to three hours to get an image. Yesterday the computer fired the camera and the image appeared on screen three or four seconds later. Ah, technology. 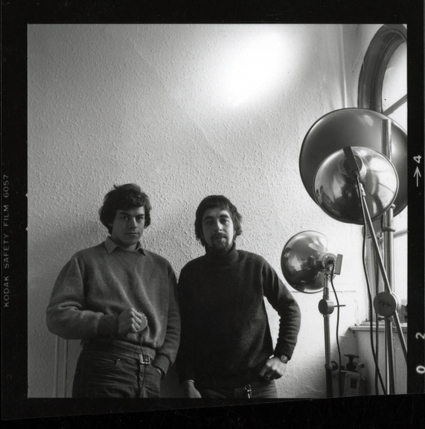 Just after we left Liverpool Art College, we set up in business, in Leeds, as photographers. My partner in crime was my friend Monty. We're both still taking photographs, but he takes slightly more than me as you can see. 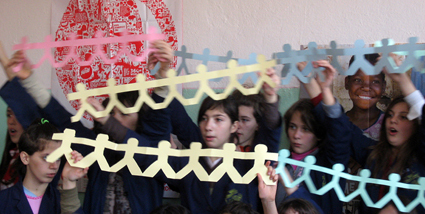 I’m flying back out to Kosovo this week, to do a film for Comic Relief - 150 primary school children from Gjakova making paper-chain people and writing messages on the paper people for Comic Relief to present to the G8 leaders. It’ll be good to go back and meet up again with friends I made there in the summer.